This entry was posted in Chinese, Chinese characters, Classical Chinese, dictionary, English, languages, linguistics, Mandarin, pinyin, romanization, writing systems and tagged chinese dictionary, english-chinese dictionary, oxford chinese dictionary by Pinyin Info. Bookmark the permalink. 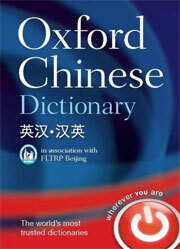 I’ve been advised that the expected release date for the addition of Pinyin to the online Oxford Chinese Dictionary is in two weeks: November 29. I’ll post once I know more about what exactly this looks like.